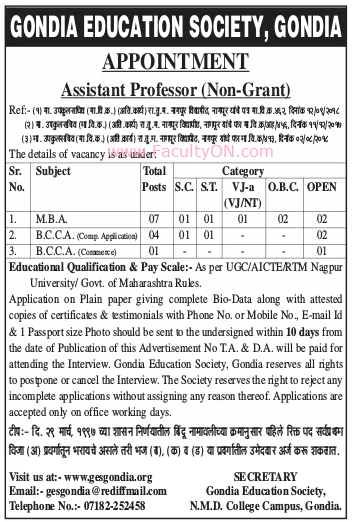 Gondia Education Society, Gondia has advertised in the LOKSATTA newspaper for recruitment of Teaching Faculty- Assistant Professor jobs vacancies. Interested and eligible job aspirants are requested to apply within 10 days from 20th September 2018. Check out further more details below. About College: The Society was formed by Late Shri Manoharbhai Patel to improve the level of education in the district of Bhandara in Maharhastra. The objective being the overall development of the personality of an individual. To this end , the NMD College of Arts and Commerce was established. How to Apply: Interested and eligible candidates are requested to send applications on plain paper giving complete bio-data along with attested copies of certificates & testimonials with phone number or mobile number, email ID, and 1 PP size photo to the postal address given below.